Gary Stanley Becker (/ˈbɛkər/; December 2, 1930 – May 3, 2014) was an American economist and empiricist. He was a professor of economics and sociology at the University of Chicago. Described as "the most important social scientist in the past 50 years" by The New York Times, Becker was awarded the Nobel Memorial Prize in Economic Sciences in 1992 and received the United States Presidential Medal of Freedom in 2007. A 2011 survey of economics professors named Becker their favorite living economist over the age of 60, followed by Ken Arrow and Robert Solow. Becker was one of the first economists to branch into what were traditionally considered topics that belonged to sociology, including racial discrimination, crime, family organization, and drug addiction (see rational addiction). He was known for arguing that many different types of human behavior can be seen as rational and utility maximizing. His approach included altruistic behavior of human behavior by defining individuals' utility appropriately. He was also among the foremost exponents of the study of human capital. Becker was also credited with the "rotten kid theorem." Born to a Jewish family in Pottsville, Pennsylvania, Becker earned a B.A. at Princeton University in 1951, and a Ph.D. at the University of Chicago in 1955 with a thesis entitled The Economics of Racial Discrimination. At Chicago, Becker was influenced by Milton Friedman, whom Becker called "by far the greatest living teacher I have ever had". Before turning 30, he began to teach at Columbia University in 1957, and in 1970 returned to the University of Chicago. In 1965 he was elected as a Fellow of the American Statistical Association. Becker was a founding partner of TGG Group, a business and philanthropy consulting company. Becker won the John Bates Clark Medal in 1967. He was elected a Fellow of the American Academy of Arts and Sciences in 1972, and was a member (and for a time the President) of the Mont Pelerin Society. Becker also received the National Medal of Science in 2000. A political conservative, he wrote a monthly column for Business Week from 1985 to 2004, alternating with liberal Princeton economist Alan Blinder. In 1996 Becker was a senior adviser to Republican Presidential Candidate Robert Dole. In December 2004, Becker started a joint weblog with Judge Richard Posner entitled The Becker-Posner Blog. "The Becker-Posner Blog". uchicagolaw. University of Chicago Law School. Becker's first wife was Doria Slote, from 1954 until her death in 1970. The marriage produced two daughters, Catherine Becker and Judy Becker. About ten years later, in 1980 Becker married Guity Nashat, a historian of the Middle East whose research interests overlapped his own. Becker had two stepsons, Cyrus Claffey and Michael Claffey, from his second marriage. Becker died in Chicago, Illinois, aged 83, on May 3, 2014, after complications from surgery at Northwestern Memorial Hospital. In 2014 he was honored in a three-day conference organized at the University of Chicago. Becker received the Nobel Prize in 1992 "for having extended the domain of microeconomic analysis to a wide range of human behavior and interaction, including nonmarket behavior". Becker wrote his dissertation in 1955 at the University of Chicago, which examined the economics of discrimination. At the time, economics was strictly the study of market behavior and market economies. Becker challenged the past era of economics by bringing a new investigation of social matters to economics. Becker's contribution to discrimination was unpopular with people arguing that his theory was not economics. He used the international trade model for his analysis on The Economics of Discrimination. In 1957, the publication of his thesis was the study of social issues and the market. He believed both groups can potentially be harmed. The discriminating firm can limit its own productivity and profitability. According to Becker, political equilibrium exists even in non-democratic societies. It arises out of a simple calculation that predatory interest groups and their taxpaying victims make: what return on my investment can I get by lobbying government? Becker's insight is that the gains to predators are linear, but the losses to prey are exponential, thereby stiffening the resistance of victims as the aggression of predators plods on without similarly increased vigor. Think of a gang of robbers taking half the crop from peasants. They then return for the second half. The gain to the gang of the second half cut is the same as in their first extortion. Yet for peasants to lose the last half of their crops means possible starvation and the certain loss of seed corn. They can be expected to resist violently, as they did in the Hollywood movie The Magnificent Seven and in the Japanese movie on which it was based, The Seven Samurai. These contributions to politics by Becker have come to be known as "Chicago political economy" of which Becker is considered one of the founding fathers. Becker's interest in criminology arose when he was rushed for time one day. He had to weigh the cost and benefits of legally parking in an inconvenient garage versus in an illegal but convenient spot. After roughly calculating the probability of getting caught and potential punishment, Becker rationally opted for the crime. Becker surmised that other criminals make such rational decisions believing that their judgment is based upon scarce commodity or risk seeking. However, such a premise went against conventional thought that crime was a result of mental illness and social oppression. Becker's 1964 book titled Human Capital: A Theoretical and Empirical Analysis with Special Reference to Education has gone through three editions since its original publication. Becker's research was fundamental in arguing for the expansion of human capital. When his research was first introduced it was considered very controversial as some considered it debasing. However, he was able to convince many that individuals make choices of investing in human capital based on rational benefits and cost that include a return on investment as well as a cultural aspect. A 2007 article by Gary Becker and Julio Elias entitled "Introducing Incentives in the market for Live and Cadaveric Organ Donations" posited that a free market could help solve the problem of a scarcity in organ transplants. Their economic modeling was able to estimate the price tag for human kidneys ($15,000) and human livers ($32,000). It is argued by critics that this particular market would exploit the underprivileged donors from the developing world. Becker, Gary S. (September 1965). "A theory of the allocation of time". The Economic Journal. 75 (299): 493–517. doi:10.2307/2228949. JSTOR 2228949. Reprinted as Becker, Gary S. (1995), "A theory of the allocation of time", in Humphries, Jane (ed. ), Gender and economics, Aldershot, England Brookfield, Vermont, USA: Edward Elgar, pp. 113–37, ISBN 9781852788438. Becker, Gary S. (1968), "Discrimination, economic", in Sills, David L. (ed. ), International Encyclopedia of Social Sciences, Vol. 4 Cumu to Elas, New York, New York: Macmillan, pp. 208–10, OCLC 256379373. Reprinted as Becker, Gary S. (1995), "Discrimination, economic", in Humphries, Jane (ed. ), Gender and economics, Aldershot, England Brookfield, Vermont, USA: Edward Elgar, pp. 385–87, ISBN 9781852788438. Becker, Gary S. (March–April 1968). "Crime and punishment: an economic approach". Journal of Political Economy. 76 (2): 169–217. doi:10.1086/259394. JSTOR 1830482. Becker, Gary S. (1969), "An economic analysis of fertility", in National Bureau of Economic Research (ed. ), Demographic and economic change in developed countries, a conference of the universities, New York: Columbia University Press, pp. 209–40, ISBN 9780870143021. Pdf. Becker, Gary S.; Lewis, H. Gregg (March–April 1973). "On the interaction between the quantity and quality of children". Journal of Political Economy, Special Issue: New Economic Approaches to Fertility (part 2). 81 (2): s279–s288. doi:10.1086/260166. JSTOR 1840425. Becker, Gary S. (July–August 1973). "A theory of marriage: part I". Journal of Political Economy. 81 (4): 813–46. doi:10.1086/260084. JSTOR 1831130. Pdf. Becker, Gary S. (March–April 1974). "A theory of marriage: part II". Journal of Political Economy, Special Issue: Marriage, Family Human Capital, and Fertility (part 2). 82 (2): s11–s26. doi:10.1086/260287. JSTOR 1829987. Pdf. Becker, Gary S. (November–December 1974). "A theory of social interactions". Journal of Political Economy. 82 (6): 1063–93. doi:10.1086/260265. JSTOR 1830662. Pdf. Becker, Gary S. (1976), "Pride and prejudice", in Becker, Gary S. (ed. ), The economic approach to human behavior, Chicago: University of Chicago Press, pp. 15–17, ISBN 9780226041124. Chapter preview. Becker, Gary S.; Stigler, George J. (March 1977). "De gustibus non est disputandum". The American Economic Review. 67 (2): 76–90. JSTOR 1807222. Becker, Gary S.; Landes, Elizabeth; Michael, Robert T. (December 1977). "An economic analysis of marital instability". Journal of Political Economy. 85 (6): 1147–87. doi:10.1086/260631. JSTOR 1837421. Becker, Gary S. (August 1983). "A theory of competition among pressure groups for political influence". Quarterly Journal of Economics. 98 (3): 371–400. doi:10.2307/1886017. JSTOR 1886017. Becker, Gary S. (January 1985). "Human capital, effort, and the sexual division of labor". Journal of Labor Economics, Special Issue: Trends in Women's Work, Education, and Family Building (part 2). 3 (1): s33–s58. doi:10.1086/298075. JSTOR 2534997. Reprinted as Becker, Gary S. (1995), "Human capital, effort, and the sexual division of labor", in Humphries, Jane (ed. ), Gender and economics, Aldershot, England Brookfield, Vermont, USA: Edward Elgar, pp. 153–78, ISBN 9781852788438. Becker, Gary S.; Murphy, Kevin M. (August 1988). "A theory of rational addiction". Journal of Political Economy. 96 (4): 675–700. doi:10.1086/261558. JSTOR 1830469. Becker, Gary S.; Elías, Julio Jorge (Summer 2007). "Introducing incentives in the market for live and cadaveric organ donations". Journal of Economic Perspectives. 21 (3): 3–24. doi:10.1257/jep.21.3.3. JSTOR 30033732. Pdf. ^ Glaeser, Edward L.; Shleifer, Andrei (2014). "Retrospective: Gary Becker (1930–2014)". Science. 344 (6189): 1233. Bibcode:2014Sci...344.1233G. doi:10.1126/science.1256540. PMID 24926006. ^ Wolfers, Justin (May 5, 2014). "How Gary Becker Transformed the Social Sciences". New York Times. ^ "Gary Becker (1930–2014)". jewishvirtuallibrary.org. Jewish Virtual Library. Retrieved March 29, 2015. ^ Klein, Daniel B.; Daza, Ryan (September 2013). "Ideological profiles of the economics laureates: Gary S. Becker". Econ Journal Watch. 100 (3): 285–91. Pdf. ^ "Book of Members, 1780–2010: Chapter B" (PDF). American Academy of Arts and Sciences. Retrieved May 29, 2011. ^ "Mont Pelerin Society Directory" (PDF). DeSmogBlog. Retrieved January 28, 2014. ^ "Home page". uchicago.edu. University of Chicago. Archived from the original on April 16, 2014. Retrieved May 4, 2014. ^ Teles, Steven M. (2008), "Out of the wilderness", in Teles, Steven M. (ed. ), The rise of the conservative legal movement: the battle for control of the law, Princeton, New Jersey: Princeton University Press, p. 98, ISBN 9781400829699. Preview. ^ a b c d Hershey Jr., Robert D. (May 4, 2014). "Gary S. Becker, 83, Nobel Winner Who Applied Economics to Everyday Life, Dies". The New York Times. The New York Times Company. Retrieved March 19, 2017. ^ a b c Becker, Gary S. (May 3, 2014). "Gary S. Becker - Biographical". nobelprize.org. Nobel Media AB. Retrieved June 6, 2014. ^ "Gary S. Becker profile". uchicago.edu. University of Chicago. Archived from the original on October 13, 2014. Retrieved May 4, 2014. ^ Harms, William (May 4, 2014). "Gary S. Becker, Nobel-winning scholar of economics and sociology, 1930–2014". uchicago.edu. University of Chicago. Retrieved May 4, 2014. ^ Mankiw, N. Gregory (May 4, 2014). "Very sad news (blog)". gregmankiw.blogspot.co.uk. Retrieved May 4, 2014. ^ Baer, Stephanie K. (May 4, 2014). 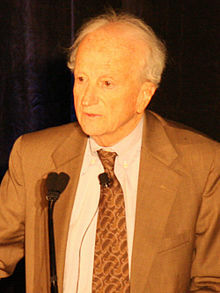 "Nobel-prize winning economist Gary Becker dead at 83". Chicago Tribune. Tribune Publishing. Retrieved June 6, 2014. ^ Comment, F. P. (4 November 2014). "A school in decline: In Chicago, economists honour Gary Becker - Financial Post". ^ Staff writer (June 6, 2006). "Gary S. Becker – Facts". nobelprize.org. Nobel Media AB. ^ OpenLearn. Economics explains discrimination in the labour market (PDF). Open University. Retrieved June 29, 2012. ^ OpenLearn. "Economics explains discrimination in the labour market". open.edu. Open University. Archived from the original on October 7, 2013. ^ Palda, Filip (2013). The apprentice economist: seven steps to mastery. Kingston, Ontario, Canada: Cooper-Wolfling. ISBN 9780987788047. ^ Becker, Gary S. (August 1983). "A theory of competition among pressure groups for political influence". Quarterly Journal of Economics. 98 (3): 371–400. doi:10.2307/1886017. JSTOR 1886017. ^ Palda, Filip. A Better Kind of Violence, Chicago Political Economy, Public Choice, and the Quest for an Ultimate Theory of Power. Cooper-Wolfling Press. 2016. ^ Posner, Richard A. (2004), "The law and economics movement: from Bentham to Becker", in Posner, Richard A. (ed. ), Frontiers of legal theory, Cambridge, Massachusetts: Harvard University Press, p. 52, ISBN 9780674013605. Preview. Harcourt, Bernard E. (2011), "The Chicago school", in Harcourt, Bernard E. (ed. ), The illusion of free markets: punishment and the myth of natural order, Cambridge, Massachusetts: Harvard University Press, pp. 133–34, ISBN 9780674057265. Preview. ^ Becker, Gary S. (1974), "Crime and punishment: an economic approach", in Becker, Gary S. (ed. ), Essays in the economics of crime and punishment, New York: National Bureau of Economic Research distributed by Columbia University Press, pp. 1–54, ISBN 9780870142635. ^ Becker, Gary S. (1962). "Investment in Human Capital – a theoretical analysis". The Journal of Political Economy. 70 (5): 9–49. doi:10.1086/258724. JSTOR 1829103. ^ Becker, Gary S. (1960), "An economic analysis of fertility", in National Bureau of Economic Research (ed. ), Demographic and economic change in developed countries, a conference of the universities, New York: Columbia University Press, OCLC 176157. ^ Becker, Gary S. (September 1965). "A theory of the allocation of time". The Economic Journal. 75 (299): 493–517. doi:10.2307/2228949. JSTOR 2228949. ^ Becker, Gary S. (July–August 1973). "A theory of marriage: part I". Journal of Political Economy. 81 (4): 813–46. doi:10.1086/260084. JSTOR 1831130. Pdf. ^ Becker, Gary S.; Landes, Elizabeth; Michael, Robert T. (December 1977). "An economic analysis of marital instability". Journal of Political Economy. 85 (6): 1147–87. doi:10.1086/260631. JSTOR 1837421. ^ Grossbard, Shoshana (2010). "How "Chicagoan" are Gary Becker's Economic Models of Marriage?" (PDF). Journal of the History of Economic Thought. 32 (3): 377–95. doi:10.1017/S1053837210000325. hdl:10419/30471. ^ Wessel, David (April 3, 2013). "The economics of leaning in". The Wall Street Journal. News Corp. Retrieved April 4, 2013. ^ Becker, Gary S.; Elías, Julio Jorge (Summer 2007). "Introducing incentives in the market for live and cadaveric organ donations". Journal of Economic Perspectives. 21 (3): 3–24. doi:10.1257/jep.21.3.3. JSTOR 30033732. Pdf. ^ Jha, Vivekanand; Chugh, Kirpal S. (September 2006). "The case against a regulated system of living kidney sales". Nature Clinical Practice Nephrology. 2 (9): 466–67. doi:10.1038/ncpneph0268. PMID 16941033.